Views of an Optimist: Z - can it be for anything other than ZOMBIE?! I felt so guilty, once I learned the truth. I had not been “there” for my family. I had been on a holiday with my girl friends. Thankfully, my husband stayed home. His quick mind pulled things together long before the government keyed anyone in. Our first night on a seven day hiatus, we sat sipping martinis while lounging at the outdoor patio. My friends and I giggled and laughed and had a wonderful time. Pointing, we “oohed and aahed” over the bright green color illuminating the sky momentarily as the meteor raced overhead. Turning to one another we remarked that it was a good omen for us to go on our casino trip the next day. Tanned and tired we hustled through the Pittsburgh terminal to catch our connecting flight home. For me, home is in Michigan. The mitten state, lower peninsula surrounded by water and the upper mitten, nearly surrounded. Isolated and yet connected. That has always been the nature of the mitten inhabitants, as well. Hustling to the monitors, we stop to check the flight information. Ready to be on our way, to see our loved ones, and just be in our own homes, we want verification that any return trip wrinkles have be smoothed out. Cancelled. All flights to Michigan, cancelled. Trying to avoid paying the extra roaming cell phone fees, we had all turned our telephones off. We had experienced a week of “disconnect to reconnect”. It had been blissful! Now, as we remembered to turn the electronic tethers back on, we found messages too numerous to count. Nearly all of them flagged as urgent! Each stepping away from the group to listen. Staggering back to one another, sobbing we hug each other. “I need a drink” was the collective consensus. Not certain what to do, we stumble to the nearest airport restaurant/bar trying to convince ourselves it can’t be true. There is one television and all eyes are glued to it. It’s true then. The state of Michigan has been cut off from all traffic. None in and especially none out. The entire state is rimmed with every available military personnel. The unimaginable has actually happened. Zombies. People in Michigan have become zombies. Lurching, red eyed, flesh hungering zombies. The calls on my phone are from my husband and daughter. The stories blurted into my headpiece have my head spinning. The beautiful meteor my friends and I saw light up the sky brought to Earth an ominous virus. A virus which at first blush appeared to be affecting the brown eyed population. However, with each day and more infections, the virus was moving through the population not just via the airborne route but through the vicious biting attacks. My husband, my daughter, a few blue eyed friends had all camped together. They were defending one another. The stand they had taken included fire arms. The stand they have taken is honorable and morally defensible. They have requested no incoming phone calls, fearful the ringtone will arouse notice. No one knows how long this virus will last, or if it will ever be eradicated. Speculation among television pundits has only confused everyone. I know my family isn't watching television, fearful of the noise. Urban life isn't safe. Only this type of looter isn't looking for your computer or television set. I wish and hope they know the signs to look for among one another. We are told, via the television set, before the hunger set in, before the nearly inhuman strength comes about, the infected person’s eyes turn red. I only pray that this horrific virus stays among humans. Start writing the screenplay for the movie! Great story to end the challenge with and like usual a killer ending. 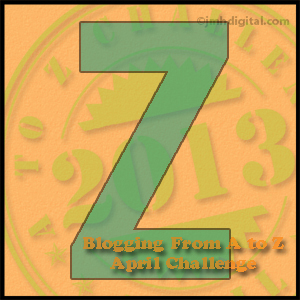 Congrats on completing the A to Z challenge! I am glad you made it! Gotta love Zombies! Plus they are sure to be very popular today.